At my high school graduation I had the honor of giving a salutatorian speech. It’s one of those opportunities where you feel pressure to say something meaningful without putting people to sleep. I mean, you’ve already waited eighteen years of your life leading up to this moment, so why belabor it with some bland commentary? Wait, that’s it? You just told them a funny guinea pig story? Well there was a little more to it. I tried to attach a small moral lesson. I think I told them, life is full of bad days but its how you respond that really matters, or something like that. That was it. Nothing too profound. Yet years later people who had attended our graduation would come up to me saying that speech had stayed with them. I was dumbfounded. Some of the best speeches you’ll ever hear are filled with powerful or funny narratives that put the listener in the driver seat. It’s an escape, really. It allows the listener to take a break from noticing how hot the room is or how hard the seats are. Stories are an invitation to break away from reality and be entertained or even moved emotionally. RED HOT TIP: Avoid starting your speech with “Hello my name is ________ and I am running for __________. Chances are somebody will already be introducing you! Why waste the precious little time you have regurgitating was has just been said? Why not dive head first into a joke, funny story or inspirational quote? You’ll have a much better chance grabbing people’s attention…IMHO. 1. Have an introduction that tells a story, makes people laugh or inspires them. What’s weird is that somebody will probably be introducing you. So why waste that time just regurgitating the same old tired introduction? A better approach for you may be to start with a story about something that happened to you recently that really hit home. 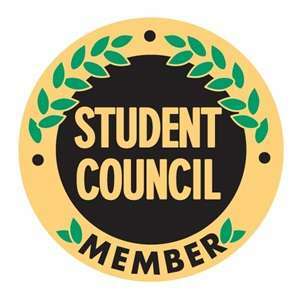 It’s best if the story has something to do with your student council ideas. Maybe you have a cool story about your childhood that fits with your campaign theme. Maybe there’s a witty joke you can tell (make sure its truly funny though, lame humor can backfire.) Or perhaps an inspirational quote from an historic leader that sets a majestic tone. In any event any event, your introduction should grab people attention by 1.) Making in them laugh 2.) Make them think or 3.) Help them catch a feeling such as inspiration. Stories, jokes, quotes and sometimes bizarre facts (“..did you know 65% of sophomores cannot spell ‘sophomore’?”) can help get them eating out of the palms of your sweaty hands. One common mistake we all make is trying to cram 20 ideas into a 3 minute speech. Sorry but that ain’t gonna work, boss. Instead do some research about what students want (see campaign section) or think of some of your own. Narrow it down to three or four solid ideas you will mention in your speech. Why not more? Well it’s simple. After a short time people’s attention begins to…..SQUIRREL! Besides, your speech isn’t suppose to be a doctoral thesis on how you plan to improve your schools bond rating. You don’t need to explain every detail. Just keep it simple and positive. 3. 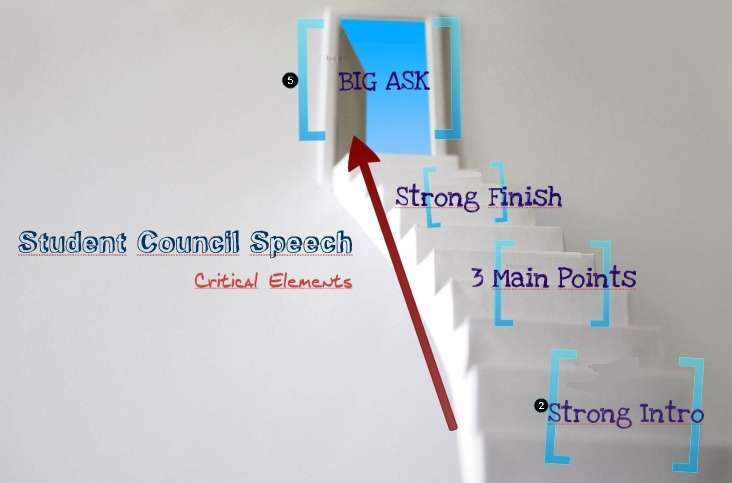 Finish strong and give the BIG ASK! My opinion is that finishing with a mini-version of your introduction coupled with a BIG ASK is a solid way to finish. The mini-introduction is a one-liner, a shorter story or an inspirational quote that hold people’s attention. Your ending should be much shorter than your introduction but functions in much the same way. You want to connect with your audience one last time at the “gut-level” or “heart-level” to leave a lasting impression. You want to do it in a way that is sincere and hits a high note after all the funny, powerful, thought provoking things you just told them! Also be sure to say “Thank You” as your last statement. Even the President of the United States ends their speech in this manner, so don’t forget to thank people for their time and support! Students in these categories will often vote for candidates who cure the short-term feelings of boredom and apathy. This why many student elections and speeches turn into popularity contests or stand-up comedy routines. Students are either bored or don’t care and just want someone who will entertain them! The good news is that what people actually want are leaders who are credible. Student don’t necessarily want to vote for the class clown or the cheerleading captain, but if no other credible candidates are out there offering compelling ideas, they will default and go with the candidates that ease the boredom of listening to student council speeches! So you might be wondering what does it mean to be a “credible leader”? Credible leaders are those who act in private as they say in public. In other words they are genuine and truthful in their words and actions. People trust them for who they arenot just who they claim to be. Credible leaders are honest, forward thinking, team-players who cast a hopeful vision for the future. 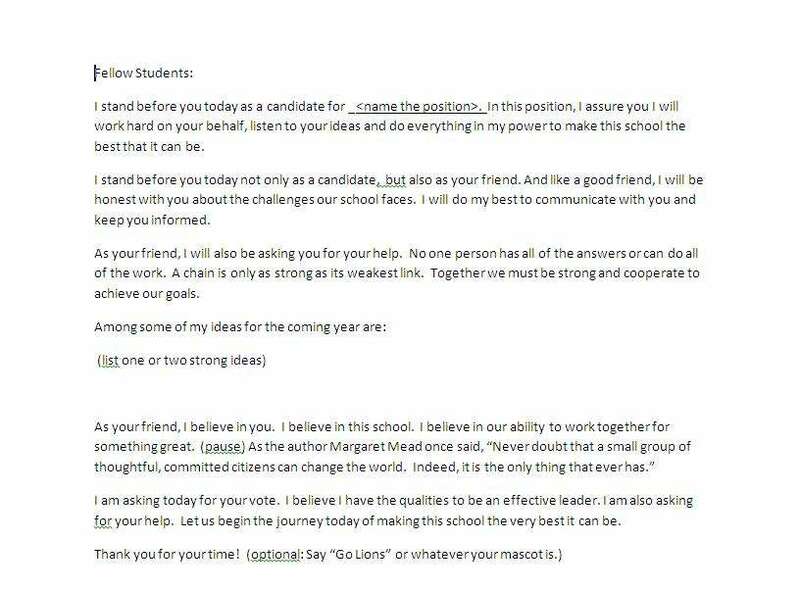 This is the kind of leader you should strive to become! Ideally, you would persuade people with the strength of your character and not have to resort to crazy stunts to get people to vote for you. The process of developing personal credibility takes time – but it is worthy goal to strive for. You will become a better person and a better leader if your words, match your actions. 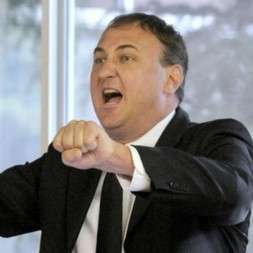 Let’s fast forward for a moment and say that your personal credibility is fine, but you want to add a little extra flare to your speech to grab people’s attention. What should you do? Well, hang on to your flapjacks amigo and check out these powerful tactics of personal persuasion. Often times people will vote for a candidate based on how they believe other people will vote. This is called the “bandwagon effect”. 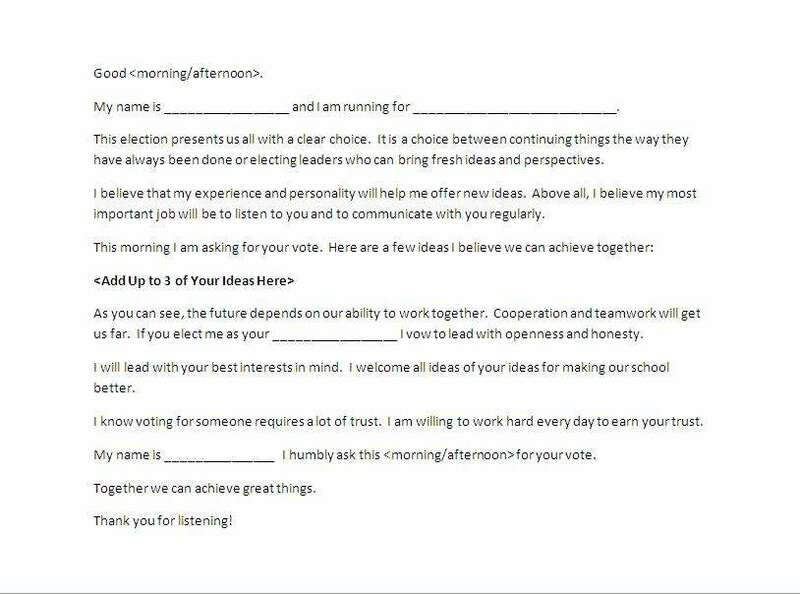 One way you can legitimately harness the power of the ‘bandwagon effect’ is to start a petition (sign up sheet) of the people who say they will vote for you and like your ideas. You can start off by asking your friends to sign up and then ask people you don’t know as well to join your cause. Whoa! Suddenly you have shifted the audience’s mindset. Now their vote actually carries some weight. You have told them that a big group of people are already supporting your ideas, so maybe they’ll think, “I should too!”. There is a famous story about a manager of a glove-making (for yard work, gardening, etc.) factory who wanted to convince her co-workers that the assembly line was making too many mistakes. For months, she tried sending out emails or stopping people in the hallway to warn them that too many mistakes were being made and that it was costing the company a lot of money. Needless to say that kind of in-your-face visual was impossible to ignore and her co-workers finally understood the magnitude of the problem. If your school will allow it, you can use the same kind of visual to grab people’s attention! For example, let’s say you want to convince people that your school is wasting too much water and you happen to know how many gallons per month or year that is. You could create a visual representation of this by filling a jar full of marbles where each marble represents a gallon of water wasted! Maybe the number of jars would fill up an entire table! You could use the same effect for such things as number of days students miss school or the number dollars wasted doing a ridiculous project that nobody really likes. People respond to visuals in a powerful way, so use this to your advantage. Make sure the numbers are accurate so you don’t mislead anyone, but try to think of a visual that will have a powerful symbolic meaning!